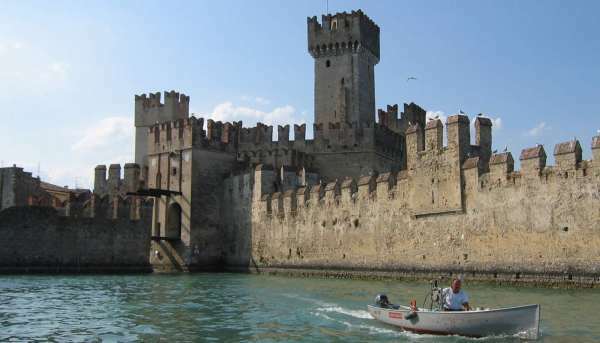 The castle of Sirmione was probably built on the ruins of an antique roman fortification and had the purpose of protecting the city from external attacks and controlling the dock. Today it is possible to access the castle only through the drawbridge, entering the main courtyard surrounded by the tall walls and angular towers. The dock that we can see today is probably the one built by the Republic of Venice, modelled after its own Arsenal, replacing the old wooden wharf. Inside the castle is a portico that hosts a roman and medieval lapidary. By ascending a flight of stairs and crossing a drawbridge you can access the second paddock. Here, by going further up, you can admire the imposing and fascinating dock, the refuge of the Scaligera fleet. 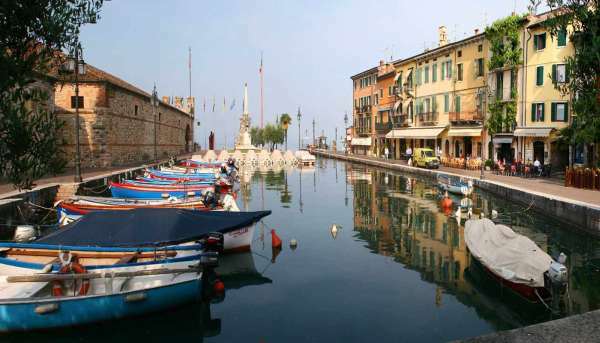 With our boat excursions, after the normally planned stop in Sirmione, we’ll be departing from Porto Castello near the Scaligera castle, one of the best conserved and most visitable castles, and we’ll navigate close to the coast of the peninsula, from east to west, roundly. We can admire the thermal structure of the Aquaria Wellness Centre, the splendid Villa of Maria Callas, the roman ruins known as Catullo’s Grottos, and the interesting water bubbles that emerge on the surface of the water near the Boiola Spring where the thermal water of Sirmione comes from.